Terror groups are now pointing tens of thousands of missiles at Israel, a top IDF officer told listeners at the Herzliya Conference. 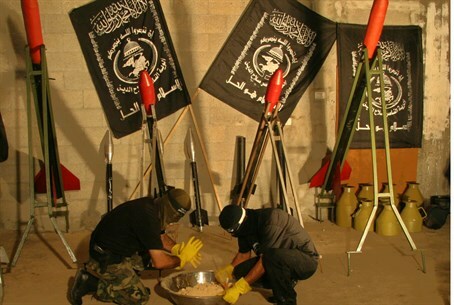 Terror groups have managed to replenish their supply of missiles, a year and a half after Israel delivered a crushing blow to Hamas in Operation Pillar of Defense, said Itai Brun, director of research in the IDF Intelligence branch. Speaking at the annual Herzliya Conference, Brun said said that there were hundreds of long-range missiles in Gaza – and that between Hezbollah, Hamas, and the other Gaza terror groups, there were now 170,000 missiles aimed at Israel. Replenishing their missile supply was a chief aim of both Hezbollah and Hamas after the 2006 Lebanon War, in which Hezbollah attacked Israel with thousands of rockets, and Pillar of Defense in 2012, when Hamas slammed Israel with over 10,000 rockets. The campaign has been very successful, Brun said, citing the 170,000 figure. With that, he said, most of those rockets were of the Kassam variety – homemade, very short range. However, things are changing for the worse, he told hundreds of listeners at the Conference Monday. “Until now the terror groups had no guidance systems and could only approximate targets, but they are improving their aim, thanks to technology. Iran has been very helpful to them in this regard,” he said. Regarding Iran, Brun said that the negotiations the country was holding with the West on its nuclear program was very entwined with the visions various groups in the country had for Iranian society. So far, he said, the Iranians were keeping to the agreements they had made, but make no mistake – they were doggedly preparing for the “great war” against Israel and the Jews, he said. Iran was also working hard to make its mark on Syria, where, Brun said, 80% of the forces fighting Bashar al-Assad had an Islamist agenda. Many of the victories in the revolution, however, have been achieved by secular groups, which are currently in control of areas of Syria bordering Israel. Assad, added Brun, was indeed dismantling his chemical weapon stash, as promised, but his soldiers were getting weary of defending their boss, he added.